This story originally appeared on July 22, 2013. 160 feet from tip to tail. 185 feet across. 240 tons of metal, fuel, bombs and human flesh traveling at 650 miles per hour. 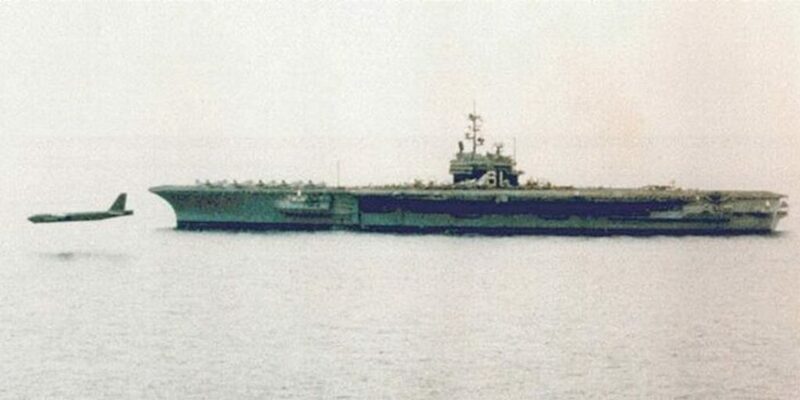 You wouldn’t think something so big, moving so fast, would also be capable of skimming the ocean surface at an altitude of just 80 or 90 feet, lower than the deck of an aircraft carrier. The U.S. Air Force’s Boeing B-52 bombers can, and have, done just that. And there are photos and pilot testimonies to prove it. The Air Force has been upgrading its 50-year-old B-52H bombers with the latest electronics, prepping the giant warplanes for another three decades as America’s most fearsome aerial weapon. In particular, the brass want the long-range bombers to help deter Chinese aggression in the Pacific and, in the highly unlikely event of major war, send Beijing’s hundreds of warships to the ocean bottom. The B-52 force has been preparing for that mission for decades. As far back as the late 1970s, bomber crews honed sea-skimming flight profiles that would hopefully allow them to penetrate stiff enemy defenses and blow the Hell out of ships — Soviet ships, that is. The Website Vintage Wings of Canada has described this deadly art of low-level flying. And retired Air Force B-52 pilot Doug Aitken told the site about his own experiences pushing his bomber down to wave-top heights during the Iran hostage crisis in December 1979. We were tasked by the [Joint Chiefs of Staff] to fly a mission deep into the Indian Ocean/Persian Gulf to surveil the Soviet fleet. At this time, the U.S. 7th Fleet was in the area being shadowed by the Soviets, and their Bear bombers, launching from Afghanistan, were harassing our carriers. The JCS evidently wanted to show the Soviets and the Iranians that our strategic air power could reach them that far out. This deception was successful. The crews made contact with the U.S. Navy and were vectored to the Soviet fleet. On their first pass, the Soviet crew were on deck waving, at first assuming the aircraft were their Bear bombers. On the second pass, not one member of the Soviet navy was to be seen. 30 hours and 30 minutes in duration, the bomber sorties became known as “Winchester missions” — deadly like the .30-30-caliber rifle.